Melanie Abrantes Designs will be attending NY Now again this February! She will be showing a new line of goods at JOIN Design's booth #3950. If you're interested in doing wholesale with Melanie, this would be the perfect opportunity to see her wares in person! Otis College of Art and Design turns 100 on September 30, 2018. To celebrate this milestone, Otis College is embarking on a year-long campaign to support and celebrate creative individuals and communities. Melanie was invited to speak on a panel at her alma mater, Otis College of Art and Design's 100 year anniversary in November! She will be a part of the panel that discusses what it is like to be 100% on your art and work after college. Join x Poketo Holiday Pop-up Market! 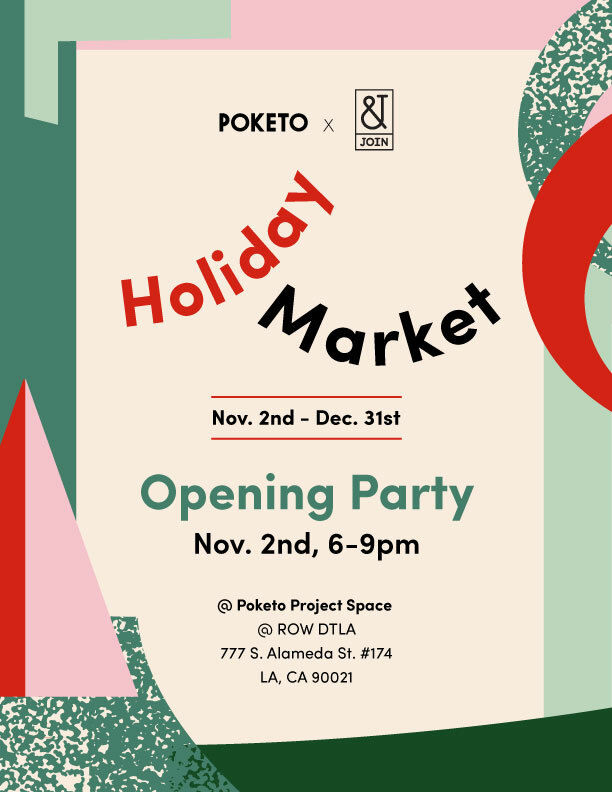 JOIN Design is partnering with Poketo once again for a holiday market at their beautiful new space at ROW DTLA. If you’re in Los Angeles, be sure to stop by to shop housewares, accessories, and all of your holiday gifts, made by independent designers. Melanie will be exhibiting at 1000 Vases which is apart of Paris Design Week. 1000 Vases is an exhibition redefining space and the presentation of the art object. The scenography by the Italian architect Roberto Baciocchi states that the value of a work can be enriched by its proximity to another piece. The proliferation of vases actually represents the concentration of artistic creativity. The swarm of objects brings forth an emotional tingling sensation; the exhibition itself is a collector of emotions, and reflects humanity in all its diversity and richness. Roberto Baciocchi is among the international founders of the architectural interpretation of commercial premises in the luxury field. His activity, world-wide acknowledged and recognizable, is characterized by innovation - yet in full compliance with the standards and the DNA of the brands it refers to - and by the attention to and respect for the historical, architectural and social context of the environments, buildings and countries he works in. The Holiday Pop Up curated by Abacus Row is having a terrific one-day Market! They've invited our favorite local and independent brands to all set up shop for the market. Please join us in supporting these talented makers and designers. Stay tuned for the final line up! Food & Drink | Hedge Coffeeand Le Dix Sept will also be setting up shop to offer their perfectly brewed coffee and crafted pastries. Come by the Winter Pop Up curated by Abacus Row and held at our new event space Banna. Our Winter Pop Up will be held December 6th - 23rd and open daily from 11 am - 7 pm, come by and shop some of our favorite local makers and designers. Stay tuned for our final line up of designers who will be stocking the shop with jewelry, leather bags, ceramics, home goods, gifts for baby, candles, body products and more. Join us for an evening celebration followed by an afternoon workshop for the book launch of Carve with author Melanie Abrantes, founder of Melanie Abrantes Designs. Tanya Aguiniga is proud to welcome Melanie Abrantes for an evening celebration with Author Melanie Abrantes. Tanya will host a discussion with Melanie at her studio in Frogtown. The following afternoon Melanie will teach a spoon carving workshop at the Kin and Kind Shop all in celebration of Abrantes' first book, Carve, A Simple Guide to Whittling. When: Book Launch Saturday, October 14th, Carving Workshop Sunday, October 15th. Join us for an afternoon celebrating the book launch of Carve with author Melanie Abrantes, founder of Melanie Abrantes Designs. Join Shop is proud to welcome Melanie Abrantes for an afternoon workshop and discussion of Abrantes' first book, Carve, A Simple Guide to Whittling. Join us for an afternoon celebrating the book launch of Carve with Melanie Abrantes, founder of Melanie Abrantes Designs. The Makery Studio is proud to welcome Melanie Abrantes for a carving workshop and lunch in celebration of Abrantes' first book, Carve, A Simple Guide to Whittling. When: Carving Workshop followed by lunch Friday, September 22. Join us for an evening celebrating the book launch of Carve followed by an afternoon carving workshop with Melanie Abrantes, founder of Melanie Abrantes Designs. Little Paper Planes is proud to welcome Melanie Abrantes and photographer Melanie Riccardi for a discussion moderated by Kelly for Abrantes' first book, Carve, A Simple Guide to Whittling. Join us for an evening celebrating the book launch of Carve with Melanie Abrantes, founder of Melanie Abrantes Designs. WantedDesign is proud to welcome Melanie Abrantes and a panel of designers for a discussion of Abrantes' first book, Carve, A Simple Guide to Whittling. Melanie Abrantes Designs will be attending NY Now again this august! She will be showing a new line of goods at JOIN Design's booth #4276. If you're interested in doing wholesale with Melanie, this would be the perfect opportunity to see her wares in person! Designer Melanie Abrantes will lead students in hand carving their own wooden spoon using traditional Japanese tools and techniques. The class will start with a discussion of different wood types, an explanation of the tools required, and an overview of the techniques used to cut wood. Once students have acquired a basic understanding, Melanie will lead them in carving the bowl of the spoon with the spoon gouge, then designing and whittling the handle and top of the spoon. When the final design has been reached, students will sand and finish their spoons with an all-natural finish. All tools will be provided to use during the workshop, with the option of purchasing the tools to continue your spoon making practice at home! You can rent tools for $20 the day of or you can purchase the kit for $79 during or after the class. The class will be held at Melanie's Studio in Oakland. Limited seats available. Please try to arrive 15 mins before the class. begins. Join Design presents Make Use, displaying works from West Coast Designers at ICFF. Make Use: A collection of objects for the home that celebrates the harmony between form and function through the marriage of materiality and process, craft and purpose. This curated collection of objects embrace raw materials, celebrate the maker's hand, and honor the everyday. This group of independent studios has designed objects that connect the user, the maker, the material and the process. Make Use celebrates the raw honesty, simple straightforwardness, and beauty in utility associated with West Coast Craftsmanship. We’re excited to announce that in one month, Melanie Abrantes Designs will be showcasing together with Design Milk at ICFF 2017 with our Milk Stand popup shop in booth #105! You can see the exhibition Outside the Box up in display in Brooklyn May 17-23 at Wanted Design. Melanie curated a box of 8 different designers from the Bay Area. The exhibition was in Toronto Design Week last January and will is now traveling to NY. Please come check it out if you're in town for NY Design Week! East Bay Mother's Day Pop-up! East Bay Mother's Day Pop-up! Save the date on May 7th and shop handmade for mom! We are teaching another Spoon Carving class! This time the location will be in San Francisco at the Riccardi Studios. Check the shop to buy tickets! Designer Melanie Abrantes will lead students in hand carving their own wooden spoon using traditional Japanese tools and techniques. The class will start with a discussion of different wood types, an explanation of the tools required, and an overview of the techniques used to cut wood. Once students have acquired a basic understanding, Melanie will lead them in carving the bowl of the spoon with the spoon gouge, then designing and whittling the handle and top of the spoon. When the final design has been reached, students will sand and finish their spoons with an all-natural finish. All tools will be available for use during the workshop, with the option of purchasing the tools to continue your spoon making practice at home! Studio Opening and 3 Year Bash! Two hours with Melanie Abrantes. Learn about traditional Japanese tools and the unique techniques for using them. We will walk you through a variety of steps of how to carve using a knife and how to finish your wooden hair pin. Leave the class with a gorgeous piece you can gift someone or keep for yourself! Please join us for our fifth annual Remodelista SF Market at Heath Ceramics. Nearly 50 local artisans from the San Francisco area will be showcasing their homewares, clothing, jewelry, organic botanicals, gourmet foodstuffs, and more. La Fem Holiday Pop-up and Workshops! LA FEM Holiday Pop-Up is taking over Social Studies this December! The Holiday Pop-Up is a gorgeously curated temporary space exclusively featuring Female Designers and makers working in the Bay Area! We're highlighting the diverse spectrum of female creatives in our city and can't wait to show off the work of this talented group. Friday, December 9th will be the OPENING PARTY! Come join these talented studios to celebrate the season, shop, and drink the night away! (Thai + Lao+ vietnamese) street food to all the streets.http://www.supoaklandstreetfood.com/. Get your holiday shopping in early and purchase beautiful wares by Melanie Abrantes Designs. We will be debuting a new line of home good products made from an exclusive cork Melanie recently imported from Portugal. Get the first look at the show! West Coast Craft is this Nov. 12-13th, 10am - 6pm, come by to enjoy a drink and shop local! Teaching another Spoon Carving Class in my studio this upcoming October! Teaching another Spoon Carving Class in my studio this upcoming September!